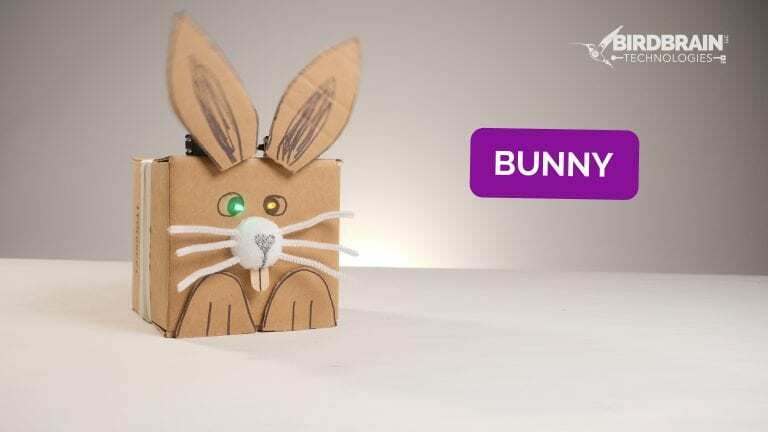 Meet the bunny, a simple “pettable” robot that is made from common craft materials. We call it a pettable robot, because it is activated when someone pets it! 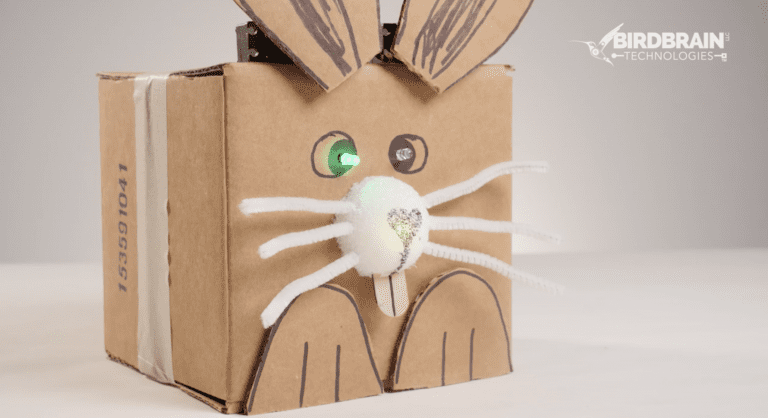 The bunny uses LEDs, position servos, and a light sensor, making it a great starter robot. 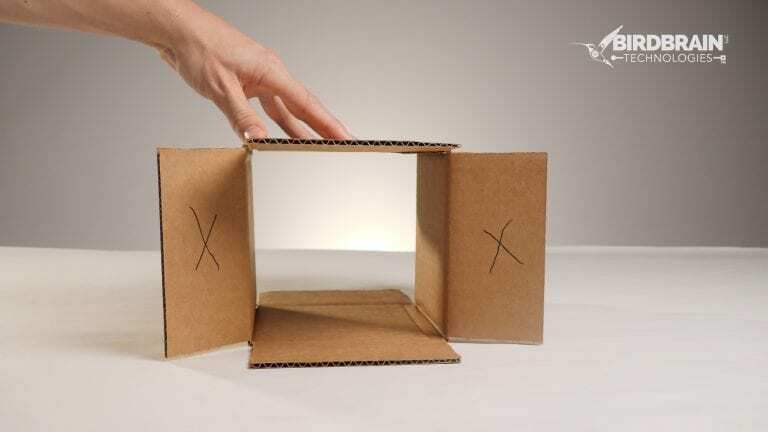 Mark the vertical tabs of the box with an X. Do this on both sides of the box. Cut off all 4 tabs with the X’s. Set those tabs aside. You will need them later. Tape one side of the box shut. 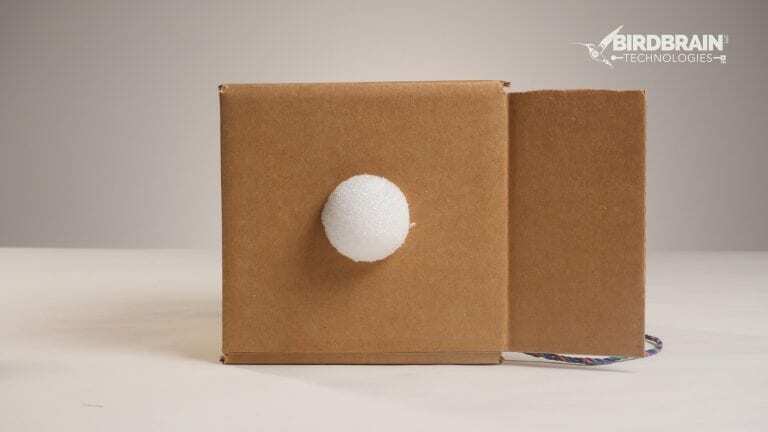 Use the string to cut the foam ball in half. There are many ways to cut a foam ball. You do not have to use this method, but we’ve found this to be among the safest methods. Stick the tri-color LED into the flat end of the halved foam ball. This will become your bunny’s muzzle. 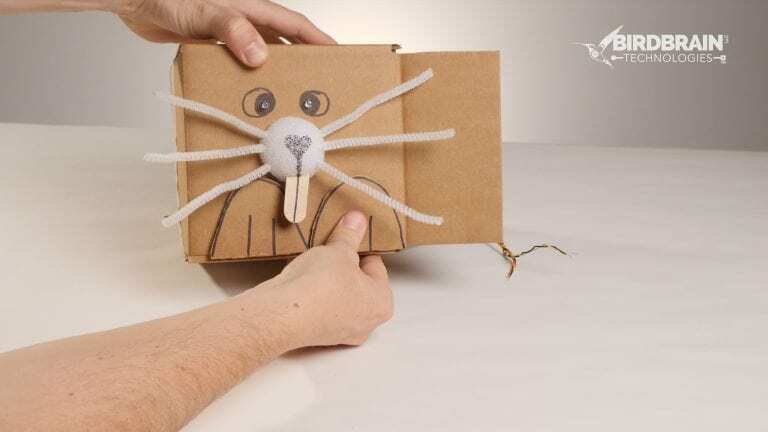 Choose which side of the box is going to be your bunny’s face. Using a blade, make a hole in the center of the face. Feed the tri-color LED wire through the hole until the muzzle sits flush against the face. 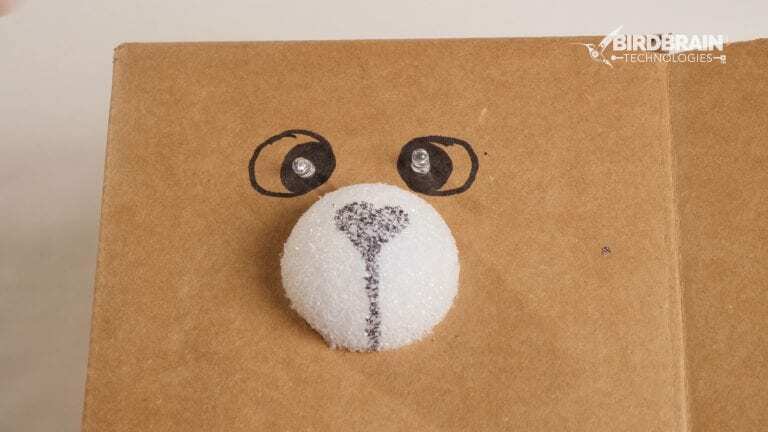 Note: Some people choose to put a dab of hot glue behind the muzzle to hold it firm against the bunny’s face. 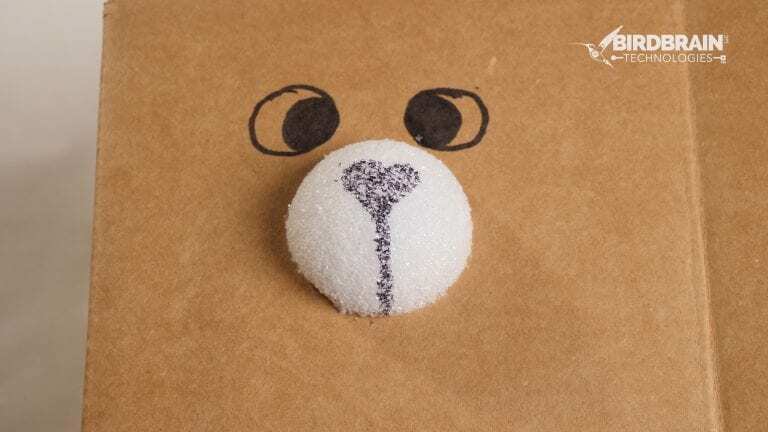 Draw eyes and a nose on your bunny. It does not have to look like this! Poke a hole in each of your bunny’s eyes. 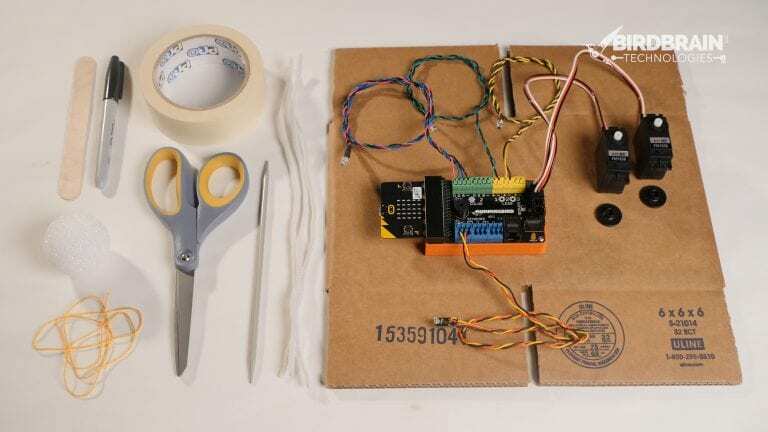 Feed the single color LED wires through the holes until just the LED sticks out of the cardboard. Poke a hole in the center-top of the bunny’s head. Feed the wire of the light sensor in through hole until just the sensor is outside of the box. Poke a hole in a piece of tape. Feed the “sensing part” of the light sensor through the hole. 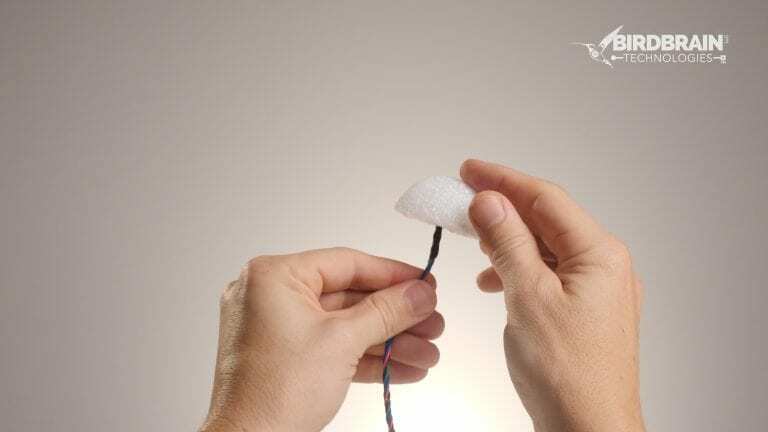 Secure sensor to the top of the head using the tape. Cut the 3 pipe cleaners in half to create 6 sections of pipe cleaner. 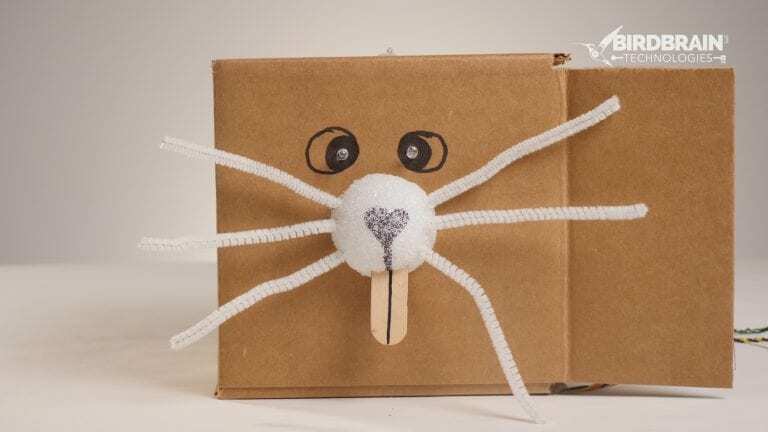 Push the pipe cleaners into the muzzle to create whiskers. Draw a line down the center of the craft stick. This is your bunny’s front teeth. Push the teeth into the bottom of the muzzle. 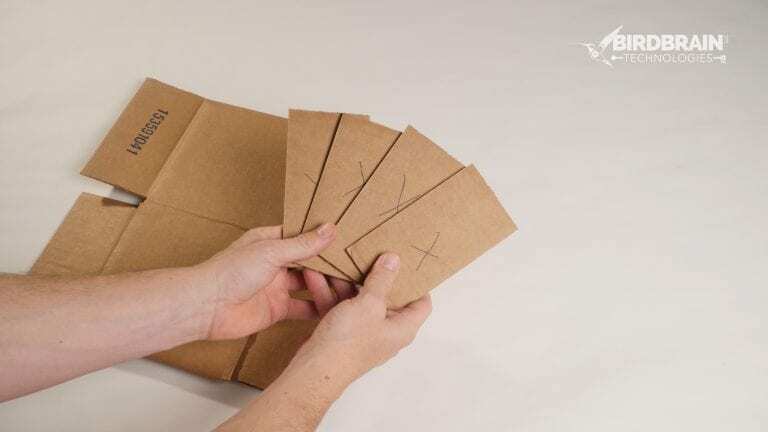 Draw a pair of feet on a cardboard tab. Cut them out. Roll a piece of tape. Use the tape to attach the feet to the front of the bunny. 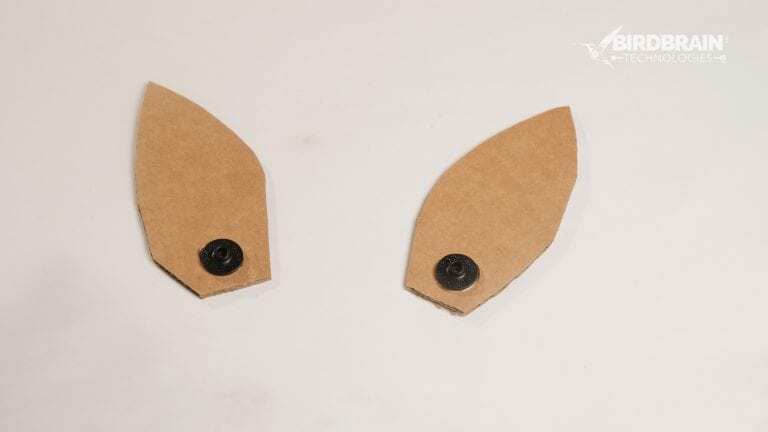 Use 2 cardboard tabs to create 2 ears. Cut out the ears. Glue the servo horns onto the back of the ears. Be sure not to get glue into the center hole of the servo horn. Push the ear onto the shaft of the position servo. Repeat this process for the second ear. Glue the ears to the top of the head. Make sure the servo wires are pointed in, towards the center of the head. 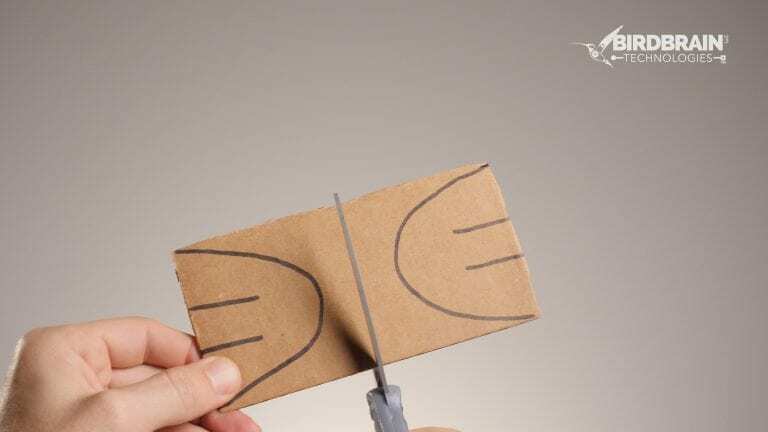 Using your blade, make a hole between the 2 servos. 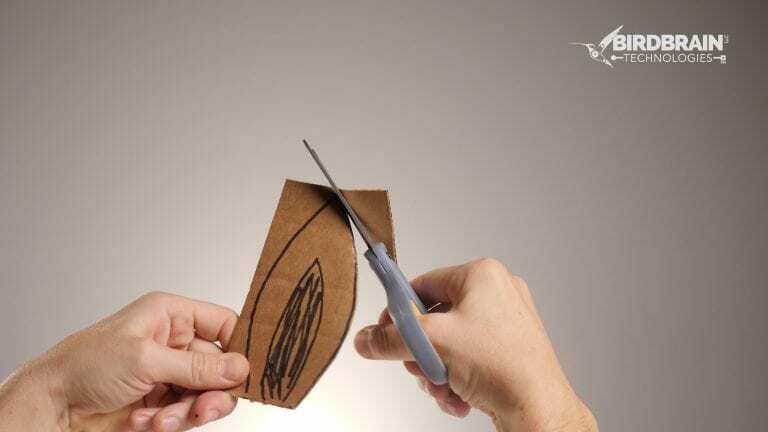 Use a pair of scissors or a marker to widen the hole. 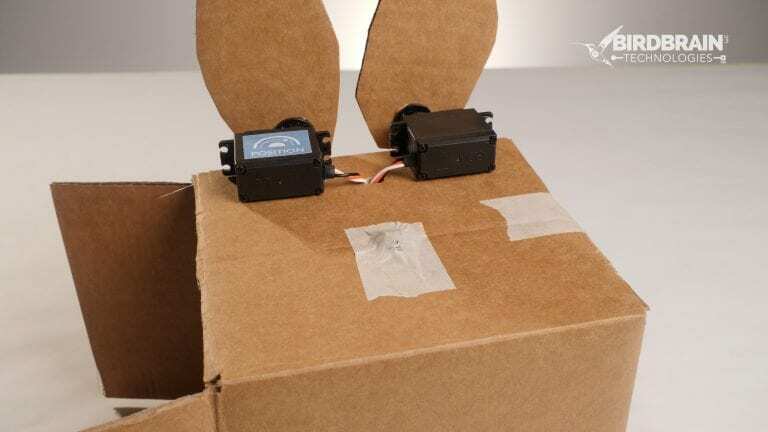 Feed the servo wires through the hole in the box. Place the Hummingbird inside the bunny and tape the bunny shut. You are now ready to start programming! Need help getting started? Select your desired programming language and device from this page.